My stomach rumbles every time I pass by a tiny Kebab corner with garlicky smoke or a Shawarma grill on the street. Even when my neighbours light up their charcoal grills for Kebabs in February, I am tempted to go over and say Hello! There’s something about Middle Eastern food that brings people together to eat. Passing a over platter of hummus & pita or crowding around a plate of freshly grilled kebabs, and even wiping off that last smudge of Tzaziki from the mezze platter is what Arabic feasts are all about! Just like that, last night the food of Lebanon, Egypt and Iran brought together people from Kolkata, Hyderabad and Delhi together at one table in Courtyard Marriot, Hinjewadi. There were some quick intros and some laughs interspersed with Mmmmz of the succulent Kebabs. In my experience as a food consultant, cooking and experimenting with food I know how difficult it is to deal with chicken to make succulent kebabs. Very few can nail the technique, as it depends not only on the quality and freshness of meat but also the cut of the meat and technique used to cook it. It is not easy to make chicken mince or tikka kebabs evidently juicy, cooked and evenly spiced through the meat. And I have to say, Chef K.K Gopalkrishnan nailed it! In my opinion the best part about the Middle Eastern Food Festival at Courtyard Marriott was its subtlety. It is commendable how the cumin and lemon flavours in a flavourful chicken stock were pronounced and balanced in the Soup – a – Murg. I do not know if such a soup actually exists in Arabic cuisine but the combination of flavours do, and they were beautifully balanced and rounded by lemon. The Joojeh Kebab and Joojeh Kobideh were my favourite on the tasting menu. 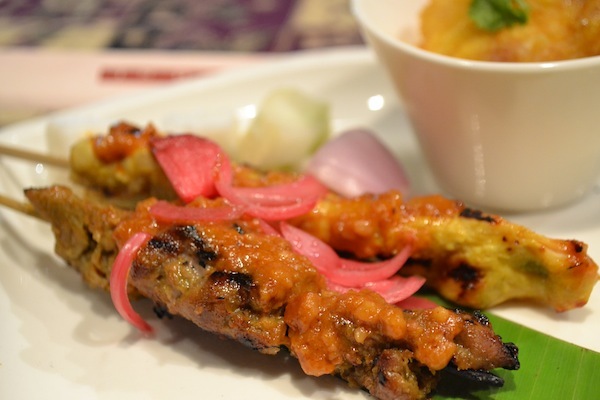 While joojeh kebab was a tikka style kebab, it was lightly spiced with very understated flavours that were highlighting the freshness and flavor of the thigh meat rather than taking away from it. Similary, the Joojeh Kobideh minced chicken seekh kebab was very lightly spiced and fresh, and I have no idea how the Chef managed to make it so juicy and well cooked. Above all, the kebabs were not oily and very light on the stomach. The Chelo Kobideh seekh that is mutton seekh was also flavourful and tasty, but because I know how challenging it can be to cook chicken right, the chicken kebabs won it for me. If I were a vegetarian, I would go to the festival for the dessert. While the hummus, pita and falafel were satisfactory, they weren’t as delicious as the non-vegetarian fare. I know it is cliché to say this in a Kebabs and grills place, while I enjoyed the falafel, it isn’t something I’d go back for. The main course too was enjoyable, but in some ways I felt like I had already enjoyed the high point of the meal in the form of the amazing Kebabs. The meat and aubergine stew was non spicy yet very refreshing and flavourful, the aromatic rice gave it an oomph that was even better than the stew itself! Even though, on a regular day I don’t save my appetite for dessert, there’s no way I can miss the rare Baklava that oozes with syrup as you bite into the crispy richness of nuts. The date ice cream is oh-so-creamy it is criminal to serve just one scoop. The hot om ali pudding was similar to a Halwa with rabdi on top, but a richer, nutty version of it. I’d totally make a second trip here for the dessert. Although it wasn’t a part of the Food festival I was invited for, I must mention the Golden Martini that I tried with this meal. It was flavoured with elder flower and it is by far the yummiest, most aromatic cocktail I have had in a long long time, and I’ve had a lot of cocktails! It is worth mentioning that this drink alone, with or without the food festival is likely to bring me back to Ignite in Courtyard Marriott for a drink with friends. If you are visiting Ignite, don’t miss their Golden Martini, I am not surprised their Mixologist was awarded by the Times Food Guide this year because this drink at the bar tasted very promising. I would recommend the Courtyard Marriott Arabian Nights Food festival to all those who love Kebabs and a good drink. The food festival is on till 9th February and there is an extensive a la carte menu with a variety of Kebabs and mezze to choose from. Ignite has a lounge like feel, with canopy seating areas made for groups. I think it is a great place for an evening out with friends. Let me know if you end up trying some of their other dishes and share your experience in the comments below. If there is a new place or a cuisine you would like to try, or a variety of food you are trying to find in Pune or Mumbai, mention it in the comments and I’ll do my best to find it for you. India Jones, at the Trident Mumbai serves cuisines from the Orient, including Chinese, Japanese, Vietnamese and Malaysian dishes. Since 2002 India Jones has won several awards and accolades. India Jones is running a Malaysian food festival till 5th November, 2014. Malaysian Chefs from Mandarin Oriental have flown to Mumbai to offer the most authentic flavours and best offerings from their land. Chef Kamarudin has even carried his special homemade pastes and authentic spice mixtures to make the experience as authentic as it can be. In fact he claims that few places in Kuala Lampur can offer cuisine as authentic and as delicious as that being served in this Malaysian festival at India Jones. Although there are some great options on the Ala Carte menu, I recommend you to go for the sample menu. The sample menu is priced between Rs 3000 and Rs 3500 per person. If you are not into over eating like me, then I will tell you what my top three picks were and may be you can choose from that! Also made and eaten in South India, making this bread requires a great amount of skill. It is perfected with years of practice but the result is worth all the hard work. 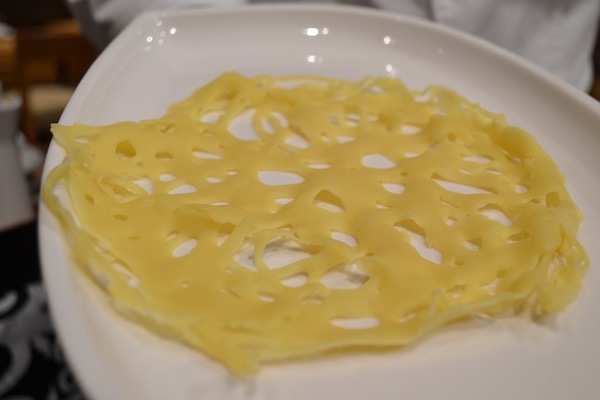 With spaces and holes in this bread, this roll of roti jala holds the curry like a sponge and gives the tongue something to play with, thanks to net or “jala” like weave. What I loved about their satay was the texture of the meat. Chicken satay is made with supreme, which is the tender-most piece from the underside of the chicken breast. I have never eaten a supreme cooked so perfectly. Most satays are easily overcooked and this piece of unsophisticated street delicacy is then dunked into sauce, which often masks its flaws and at times its assets such as a tender, juicy poultry. This chicken satay was moist, plump and succulent with flavours weaved into the meat and there was no need for sauce. As my teeth sank into it, first with vigor ignorantly expecting tough meat, and then slowly, with pleasure as I realized how soft and flavourful it was. Got a bit carried away with the chicken, but nonetheless, the beef satay was very flavourful and tender too, it didn’t seem like a single piece nor like keema on a stick, but it was chunks of flavouful meat wrapped careful together on the satay stick, making every bite meaty and full of bite! I think this dish really stands out because of the brave combination of ingredients that went into it. We Indians know the refreshing zing of green mango and how our heart sings each time we remember biting into raw mango. 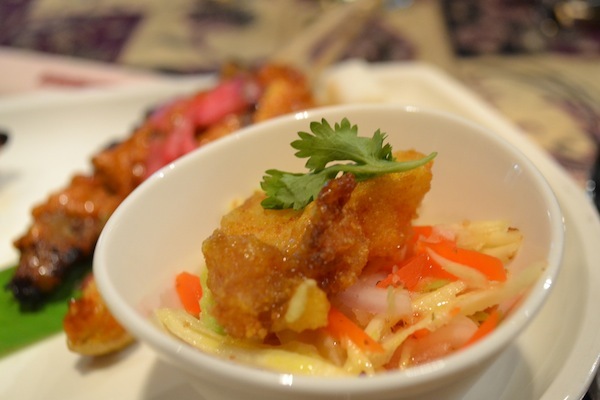 But few will have the heart to pair fried fish with raw mango salad. It surely was done well and the flavour combination was novel and hit the right notes. Tangy flavours usually go well with fried food but its usually a chutney rather than strings of marinated sweet, sour green mango. This lightly sweet marinatde brought subtle smoothness to the whole dish. Perhaps the most interesting dessert I have had in a very long time. Chocolate and cream lovers may frown upon it, but I absolutely love the way they do sweets in the Orient. Not too sweet, heavy or loud, they are just right. This dessert was an unusual shade of rose pink (always very attractive to a woman). 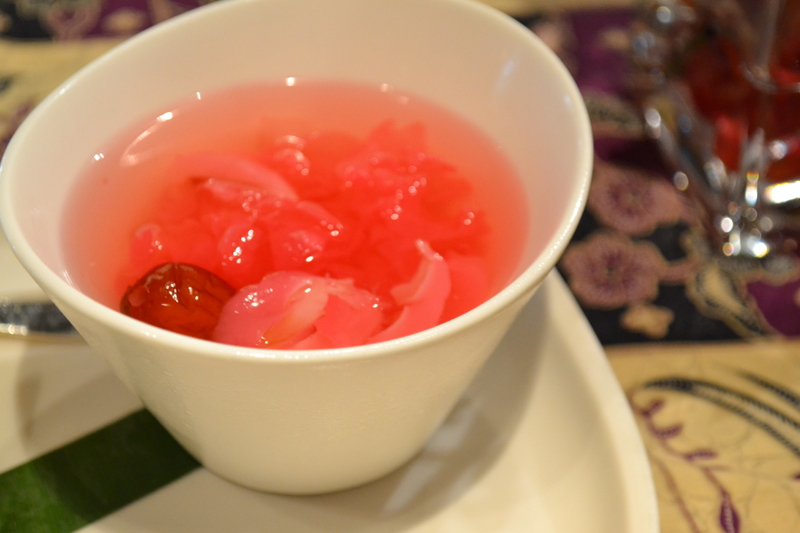 It had these little pink flower-like pieces of crunchy white fungus floating along with tropical fruits in a thin sugar syrup. The crunch of white fungus is always lovely and these little exotic fleshy fruits added another dimension to it. All in all this is a light and a must-try dessert. From the curry selection I really enjoyed the Malaysian fish curry with vegetables and the lamb curry the most. It is interesting to note how many kinds of curry can be made with the same of similar selection of ingredients. Most of these were coconut-based curries and yet each one had its own individual character and flavours, and none of them was like the other. The presence of curry leaves, tomatoes and turmeric in many of the curries gave it a rasam kind of familiarity. It was a rainbow of flavours mainly dominated with coconut, chillies and lemongrass, kaffir lime, tamarind. The dessert selection is small yet very interesting. 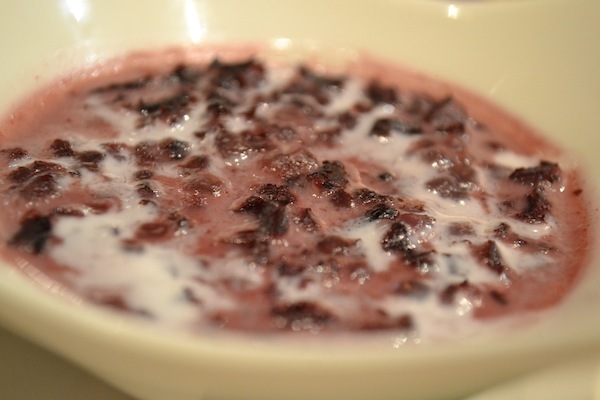 Coconut jelly and black rice soup (or should I say Kheer) complimented each other, were elegant and tasty. It is always pleasant to enter restaurants where the staff has grey hair, I think that it adds character to the place and speaks volumes about the history and culture that a Hotel like this one carries. The Trident staff is perhaps the most talked about staff with decades of experience in customer relations and top-notch service. The staff of this restaurant tells a story, and they will tell you a story, and the history of the Trident if you will. That thing about this place is the staff. They are warm, hospitable and most importantly well-read, cultured and experienced people that will host you at India Jones. Steaming, supple, warm modaks drenched in ghee, cardamom scented puran poli that melts in the mouth, a nourishing marriage of both health and flavours – thalipeeth; Puneri food is mirror of our rich heritage and an intelligent lifestyle. Authentic Puneri cuisine is synonymous with beauty in simplicity. It is amazing to see how much potential our culinary roots have. We Puneris, boast clever flavours with maximum nourishment. I truly believe that this wealth is worth showing off. I give credit to Courtyard Marriott for recognizing this potential and showcasing Puneri culture on a platter, and they twisted it to suit the global diner’s needs. This was an interesting attempt at fusion food, which smartly brought together Puneri flavours with International dishes and vice versa. At Rs.300 over the regular buffet cost, this Puneri menu is a breath of fresh air. Wada-Pav, the famed dish that boasts being the first course served to President Obama by our very own Masterchef Vikas Khanna at the White House was left untouched for good reason. The wada-pav was relatively less spicy than its roadside counterpart but nonetheless as pleasing as always. Executive Sous Chef at Courtyard Marriott, Chef Merajuddin Ansari and his team aced the fusion concept by beautifully marrying modaks with corn meal, pizza with lasan chutney and even shrikhand with croissants. Fried Corn-Meal Modaks – I know that it sounds a little weird, frankly I cringed at the thought of this modak but I was pleasantly surprised with the way it turned out. The sweetness of corn meal was blended with the oh-so-delicious flavour of coconut and the stuffing together made for a very familiar and likeable taste inside the crispy modak. Lasan Chutney Pizza- this dish just worked on so many levels. Firstly, whether it is Italian food or Maharashtrian, we love the flavour of garlic in our food. The tomato sauce was garlicky and familiar and the yogurt and lasan chutney smeared over the pizza upped the yumminess of it all. Plus, that scent of coriander and green chilli chutney with mozzarella cheese only made it more comforting and lovable. Crroissant stuffed with Shrikhand – Instead of a classic custard, chocolate or cheese Chef Ansari played cleverly by smearing the croissant with smooth, creamy shrikhand with its distinctive sour note, I’d gladly say bye to my custard after this. While the thalipeeth patty did work as a patty, even with its chilli and coriander hints, it did not have the quality to earn a name as “thalipeeth”, don’t call it that and it was good. Similarly, puran poli didn’t have that melt in the mouth quality that it should even though the stuffing had a mix of chocolate with the cooked lentils, it did not work, especially when compared with the modaks. An old friend from catering college, Ankita Velankar, accompanied me, I had asked her to come along because her family owns a Maharashtrian catering business in the city. She comes from a Puneri Brahmin family, and has grown up in a household that not only savours but also aces in making these delicacies. When it comes to fusion food, it is important to maintain the integrity of the cuisine while using new flavours only to elevate it. Ankita is not only knowledgeable but also proud and protective of Puneri cuisine, and we both thought that the Puneri food festival succeeded in elevating Puneri flavours to a great extent. I would love to see these modaks or that lasooni pizza on the Courtyard Marriott menu, not just during a festival but on the regular menu as well. These dishes succeed in showcasing Puneri Food and flavours in a familiar and subtle manner. Foreign visitors and visitors from across India, this selection had something for everyone.